K.L.E. 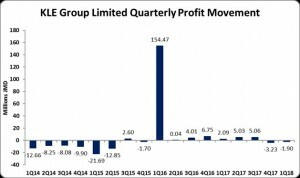 Group Limited (KLE), for the first three months ended March 31, 2018 reported Total Revenue of $51.38 million, a 4% increase when compared with the $49.40 million reported for the corresponding period of 2017. Gross Profit totaled $34.39 million, up 9% relative to the $33.88 million reported in 2017. This followed Cost of Sales of $16.99 million recorded year to date relative to $15.52 million for first three months of 2017. Other Operating Income for the quarter totaled $7.55 million (2017: $2.97 million). Administrative and Other Expenses grew by 27% from $30.69 million to $38.93 million. As such, Profit from Operations fell 51% to total $3.01 million relative to $6.16 million booked for the corresponding period of 2017. Finance and depreciation costs went up by 21%, moving from $4.07 million last year to $4.91 million for the first quarter of 2018. Consequently, Net Loss for the quarter amounted to $1.90 million relative to a net profit of $2.09 million in 2017. Loss per share for the three month ended March 31, 2018 amounted to $0.02, while for the corresponding quarter of 2017, an earnings per share of $0.02 was recorded. The twelve month trailing EPS is $0.05. The number of shares used in our calculations is 100,000,000. KLE’s stock price closed on May 16, 2018 at $2.80. As March 31, 2018, the company reported Total Assets of $205.73 million (2016: $222.98 million). The main contributors to this decline was ‘Property, Plant & Equipment’ which amounted to $42.39 million (2017: $56.89 million) and ‘Investment in Associate’ moving down by $4.07 million to end the period at $73.30 million. However, ‘Investment in Subsidiary’ increased to $3.85 million in 2018 from nil and tempered the overall movement. Shareholder’s Equity closed at $137.88 million (2017: $136.87 million) resulting in a book value per share of $1.38 (2017: $1.37).